Nawo Foods Omega 3-6-9 is a dietary supplement containing a set of unsaturated fatty acids omega 3-6-9 in precisely selected doses, providing the best benefits for your organism. The preparation positively influences the whole organism and demonstrates multi-level effect – it helps to maintain homeostasis, protects from brain-vessel disorders, lowers the risk of cancer development and also takes care of maintaining proper skin functions. The supplement ensures optimal concentration of fatty acids in the organism, contains valuable, natural seed oils: flax, oenothera, linseed, black currant and pumpkin seed oil. All the oils used in the preparation underwent the process of cold pressing, thanks to which they preserved their quality, nutritious value and constitute a perfect source of omega-3, omega-6 and omega-9 fatty acids. Omega 3 and 6 belong to unsaturated essential fatty acids (EFAs). They are polyunsaturated acids. Unfortunately, these substances are not synthesized by the human organism, therefore, in order to maintain proper processes of many key transformations in the organism, we need to take care of providing them from outside. Omega-9 is a monounsaturated fatty acid, which is also classified to EFAs, but constitutes an exception – there is a possibility of synthesizing it in the organism, but with age or as a result of liver disorders this possibility is reduced and therefore it is also important to remember about its proper supply. Omega-3 fatty acids include α-linoleic acid (ALA), eicosapentaenoic acid (EPA) and docosahexaenoic acid (DHA), while omega-6 fatty acids are linoleic acid (LA) and arachidonic acid (AA). The representative of omega-9 fatty acids is oleic acid. Numerous research proved that insufficient amount of EFAs in the organism is related to the risk of the occurrence of many physiological dysfunctions. The deficit of unsaturated fatty acids may be the cause of, i.a. increased susceptibility to infections, arterial hypertension, deterioration of the efficiency of the circulatory system, skin changes and also the decrease of mental functions and neurodegenerative disorders. For EFAs deficits mostly responsible are inappropriate eating habits (low intake of oily sea fish and vegetable oils) and also disorders on the enzymatic level, which may be caused by such factors as: age, alcohol, nicotine, stress, vitamin and mineral ingredients deficits, excessive exposition to UV radiation and frequent infections. Essential unsaturated fatty acids play an important role in maintaining proper skin condition and support its regeneration. They are responsible for, among others, lipid balance of epidermis, sebum secretion and intercellular cement structure. These substances strengthen defense barrier of skin and counteract excessive water loss. Their deficit leads to disorders of epidermis keratinization, which manifest themselves in dry skin and excessive exfoliation of epidermis. Moreover, it negatively affects the state of hair and skin – increases their brittleness. Currently, EFAs deficit is considered to be one of the main causes of psoriasis and also it may appear in the process of other dermatoses (e.g. atopic dermatitis, acne). Unsaturated fatty acids play an incredibly important function in counteracting the ailments of the nervous system, among others because of the fact that they are the components of mucous membranes and improve brain blood supply. It has been observed that these substances positively influence the functioning of the central nervous system, decrease depression symptoms, increase well-being and cognitive efficiency. Scientific research confirmed that fatty acids and especially omega-3 fatty acids may slow down the intensity of symptoms of Alzheimer’s disease and dementia. Unsaturated fatty acids are incredibly vital in cardiovascular system diseases prophylaxis. These substances have the ability to decrease blood pressure among people with hypertension, stabilize cholesterol level, decrease the level of triglycerides, improve heart work and also have antithrombotic effect. Research showed that these substances lower the risk of arrhythmia and strokes in the brain, reduce the risk of developing ischemic heart disease and contribute to reducing mortality due to heart attacks. EFAs from the omega-3 raw inhibit the proliferation of cancer cells and demonstrate protective effect among others in breast cancer or colon cancer. These substances inhibit the process of carcinogenesis and lead to apoptosis of cancer cells. Moreover, it has been observed that they may counteract developing metastases and also reduce the number of after-surgery infectious complications. Summing up, Now Foods Omega 3-6-9 is a dietary supplement essential not only to maintaining physical efficiency, but also mental abilities. Multidirectional activity of the preparation makes it effective both to prevent civilization diseases as well to support their treatment. The supplement is recommended especially to elderly people, among whom fatty acid metabolism disorders have occurred and also to those, whose diet is characterized with low supply of sea fish and vegetable oils. Moreover the preparation is recommended to people who wish to improve the state of skin and who deal with excessive skin dryness, atopic dermatitis and acne. As a dietary supplement, take 2 softgels 1 to 3 times daily with meals. Despite the high content of fatty acids omega-3 (EPA and DHA) in sea fish, they should not constitute the main source of these acids in our diet, due to the bad conditions of breeding, possible toxicity with heavy metals and dioxins. A safe solution is to use dietary supplements. 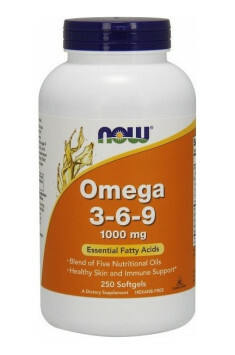 Now Foods Omega 3-6-9 contains fatty acids essential for the organism, omega-3, -6 and -9 in proper proportions, thanks to which we may be certain that it has positive influence on the organism. Now Foods is a company with years of experience in the industry that offers a wide range of nutrients and dietary supplements. Brand is known for its high-quality products designed for hair and nails and supplements supporting the immune system. The offer includes the antioxidant supplements, antibacterial supplements, reducing appetite supplements, products supporting the reduction of body fat and improving digestion. All products are made from natural ingredients. Softgel Capsule (bovine gelatin, water, glycerin, caramel powder, carob powder). Iron-free unique complex of vitamins, minerals and plant substances. Advanced, multi-strain probiotic supplement, ideal for people with sensitive digestive system. The extract of horsetail enriched with vitamins. It improves condition of hair, skin and nails. Formulated specifically with key components to keep your organs safe on a cycle and off. Dosage: the most important is to keep the balance between Omega 3 and Omega 6 acids. When proportions are kept, the quantity is not significant. Oleic acid - mono-saturated Omega 9 fatty acid, occurring in the natural products of plant origin (almonds, olive oil) and animal origin (hen egg yolk, fats derived from fish). As representative of the most common fatty acids present in the diet can be substituted for some of the saturated fatty acids and consequently have a positive effect on the blood lipid profile. In the diet supplementation it is a complementation unsaturated fatty acids.